"CAIRNS OF DISTINCTION" from Hutchinson's Dog Encyclopaedia (England, circa 1935) Specially painted for this work by T.F. Daws. This well-known artist has here caught the alert and friendly expression of two delightful Cairns, both excellent specimens of the breed. 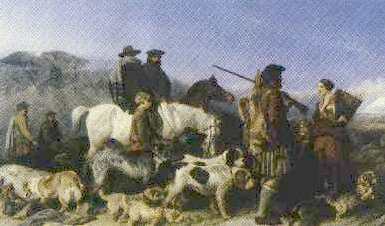 "Jock" is the property of Lady Hutchinson, and "Sandy" belongs to Mrs. Walter Hutchinson, wife of the editor. The Cairn Terrier is originally from the Highlands of Scotland where it was bred as a sound working terrier and companion. Today's breeders of Cairn Terriers seek to maintain alertness, soundness, good temperament and quality in this breed. The Cairn Terrier, unknown in England as a show dog until 1909, is actually one of the oldest breeds in existence. Many authorities are of the opinion that it is older than the Scottish Terrier, and mainly responsible for that type of dog. In England no dog has advanced more rapidly than the Cairn, and he is now one of the most popular of all Terriers in that country. He originated in the Western Isles of Scotland, where, for centuries, he has been used as a working terrier, and was formerly known as he "Short-haired Skye Terrier". His quarry mainly consisted of otters, foxes, rats and other creatures that have underground lairs. In tackling animals as large as foxes or otters, one realizes that a terrier so small as the Cairn must be extraordinarily game, and abnormally strong for his size. The Cairn is in his element in water, and possesses wonderful diving ability; he can swim for yards submerged. A story is told of one of them which, having "bolted an otter, clung tenaciously to his quarry when it plunged into the sea. His owner, becoming alarmed at the length of time the dog remained under water, dived in after him. The dog was found with his teeth still embedded in the otter's body. Cairns were first exhibited as show dogs in England at Cruft's show in 1909; but they were new to the English judges, and it was not until some of the clubs began to take an interest in the breed that the standard as we know it today was drawn up. As soon as the dog became thoroughly established in England, many breeders quickly saw its possibilities; and Cairns had come to stay. One of the first fanciers to take them up seriously and bring them under notice was Baroness Burton. The breed has been much improved since making its first appearance as a show dog; it is more definite in type and its own characteristics have been more strongly developed. Although essentially a working terrier, the Cairn, because of his handy size, makes an ideal house dog, is equally suitable for a car dog, and is big and game enough to take care of his owner's property. Almost everybody agrees that the Cairn is the foundation, stock for every Scottish breed of terrier, and that he is responsible for the likeable qualities found in all these Highland varieties. Puppies are regarded as very precious, closely watched and painstakingly raised from birth. When they are deemed old enough, they are carefully placed with responsible owners to whom they will give many years of loyalty and loving friendship. Cairn Terriers are not difficult to keep as pets. The coat is a double coat, a hard outer coat with an undercoat resembling fur, which is groomed with a short, stiff bristled brush and steel comb. They respond well to training, are easily house trained and regular exercise will ensure the fitness of both dog and owners. Because of their temperament, Cairn Terriers are also used in the Therapy Program giving much pleasure and love to people in nursing homes. Disclaimer: Reader may download one copy for personal use, but any further dissemination of the article needs to be with express permission of the author.